Entering the Luce Center for American Art on the Brooklyn Museum's fifth floor, one immediately encounters Rob Wynne’s ethereal glass works that activate the adjacent nineteenth-century neoclassical marble statues of Pandora, Nydia, The Lost Pleiad, and Bacchante. Rob Wynne’s work re-contextualize viewer perceptions of the historic sculptures perched atop black granite pedestals, enveloping them in a swirling timelessness of hand-poured mirrored-glass wall reliefs. On view through January 6, 2019, Wynne's 16 ephemeral glass works force a reexamination of historic American artworks and are presented in an exhibition entitled “Rob Wynne: FLOAT” curated by Brooklyn Museum chief curator Jennifer Y. Chi and assistant curator Margarita Karasoulas. Rob Wynne discovered his love for glass work by accident after dropping a ladle of hot glass on the floor and watching it pool and solidify in his now characteristic marbled texture. In the same mentality as his beginnings with the media, he creates unexpected encounters with the Brooklyn Museum's permanent "Art of the Americas" collection. As each turn reveals a new and beautiful application of abstracted clusters and glass texts by Wynne, the historic paintings and sculptures are engaged in a dialogue with Wynne's site-specific contemporary glass works. “Looking at art produces a mental elegiac pause," Wynne writes in his artist statement. "As I recognize what I am looking at, I simultaneously sense a gathering of feelings. There are certain touchstones in the American Art galleries that resemble such natural pauses, producing a growing sense of history and pleasure in the outpouring of sensory detail and information.” Working from this sentiment, he recreates his own experience of this gallery by applying watery shapes and phrases in key corners. Wynne metaphorically riffs on the idea of glass as a lens through which to better understand something and emphasizes those historical pieces that have influenced him. 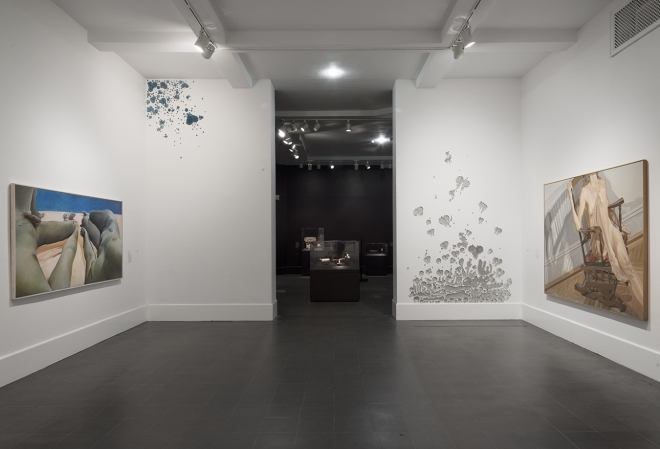 In addition to his captivating pebbled mirrors that seem to melt off the walls, he is inserting himself as interpreter- provocateur, creating artworks that function in part as annotations to certain moments and pieces in the Brooklyn Museum's permanent collection that have caused him to pause and reflect. The organic shapes and fluid text seem to hover on the wall as the light shifts as one approaches each of his installations. His work is remarkably versatile. ConsiderBLAZE, a rose-tinted biomorphic assemblage that hangs next to a small painting of two birds that inhabit a beautiful albeit fictionalized setting. Wynne's mirrored glass is the embodiment of delicateness and fragility, which compliments this delicate painting, but rendered at large scale, it also can hold its own adjacent to the overwhelming drama depicted in the painting A Storm in the Rocky Mountains, Mt. Rosalie by Albert Bierstadt. Wynne carefully selected a hazy pink color to pick up the rare correspondence between the disparate paintings. In his text-based works, the artist hand-pours letters, guiding hot glass into a literal symbol and forcing the viewer to read the piece through a different frame. The word "masquerade" placed above two portraits of Mr. and Mrs. David Leavitt by Samuel Waldo is intended to "bring up issues of what the subject of a portrait hides," Wynne explained in an email correspondence with the Glass Quarterly Hot Sheet. In a 2017 interview with West Palm Beach Magazine he explained that his work was intended to “be much more reflective so when you are reading them you see yourself reading them, but the way my process works is they get much more pebbled-water looking surface.” He effectively reinstates that reflective nature with his literary creations. The disassociated words and phrases, adopts the viewers voice and adds a layer of introspection, disrupting the barriers between art and viewer. As Wynne explains in his artist statement: “I have explored the material [glass] exposing limits and extending its essence, making poured glass texts and abstractions referring to language and art history.” Through this exhibit, he pairs beautifully textured creations with historic American art. Beyond engaging with the art pieces themselves, Wynne also brings attention to wall text with a glass exclamation point (!) and a question mark (? ), highlighting the curators' intervention on the space. As a medium, glass is vulnerable to breakage and yet it may last forever; the insertion of such a new medium on a space curated to show those pieces that have been chosen for longevity highlights the ephemeral nature of images. The ability to create fleeting images and phrases in a material so lasting is an impressive feat; one that strengthens the very essence of the museum space.